The MCM League’s February meeting is one you won’t want to miss! Make sure to mark your calendars now. Our meeting will be held at Knotty Cakes Ranch; the home of two of our MCM League officers, Kimmy & Drew. Knotty Cakes Ranch has been a labor of love for these two as they’ve done all of the restoration to their mid-century modest ranch themselves, in the Cliffgate development of Portland. They are still in the process of many projects, including their basement tiki bar, for Knotty Cakes Ranch, but want to invite all of you into their home to see the progress they’ve made to date. Even more exciting than getting to see into this home, we will be having a guest speaker all the way from down under. Chris Osborne of Australian Modern will be giving a presentation on MCM in Australia. Following the resurgence of interest in all things mid-century in Australia, Australian Modern came together to offer a unique retrospective of Australian mid 20th century architecture, design and cultural history. Australian Modern examines the projects, people and style of the period, enlightening readers about the mid century modern movement and its talented and often overlooked designers. Presented is an informative and entertaining range of topics, including Googie architecture, French fashion, the Goggomobil and Meadmore furniture, also mid 20th century suburban design, and the work of architects of the era. Wait! There’s even more! 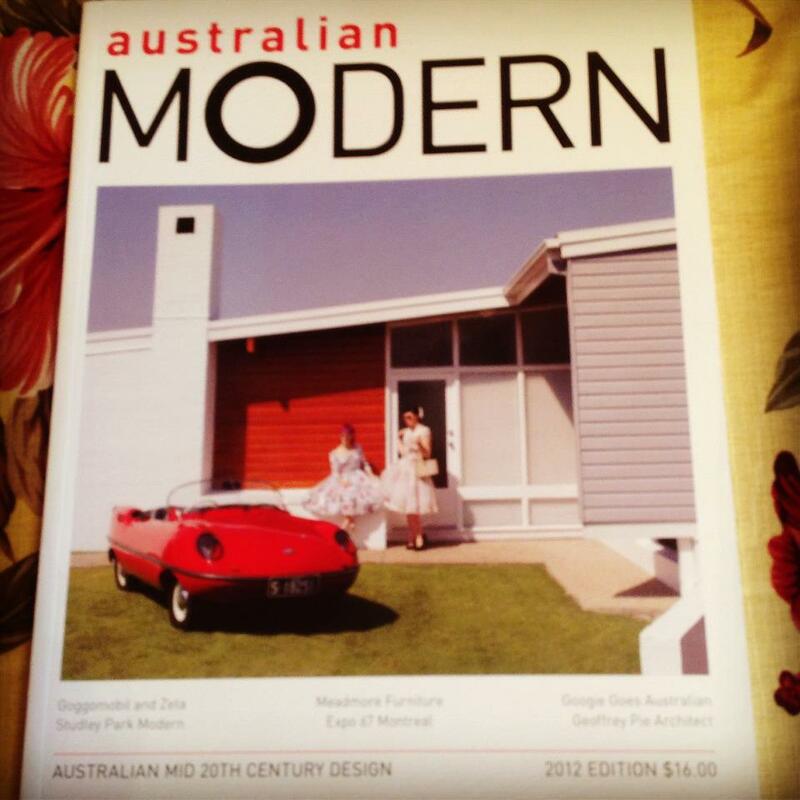 Australian Modern was kind enough to supply many copies of their 2012 Edition magazine to be given out at the door to those who attend our February meeting. Please, only one per family. Come early to make sure we don’t run out before you get your copy. Meet, greet & viewing of the Knotty Cakes Ranch will be from 5-6 pm. Meeting is at 6pm sharp. League business will be addressed, followed by the presentation on mid-century modernism in Australia by Chris Osborne. This meeting will be a POTLUCK, feel free to bring a dish inspired by the 50s, 60s or Australia to share. The MCM League will provide mixers; you may bring your own adult beverage if so inclined. This event is open to everyone, not just official League members. We hope to see you all there. Make sure to look up directions and have them with you to follow so you are able to easily find the house. This entry was posted on Monday, February 11th, 2013 at 2:01 pm and is filed under Events, Meetings. You can follow any responses to this entry through the RSS 2.0 feed. Responses are currently closed, but you can trackback from your own site.